Edelbrock proudly introduces its first-ever high-performance cylinder head developed especially for the diesel engine market! 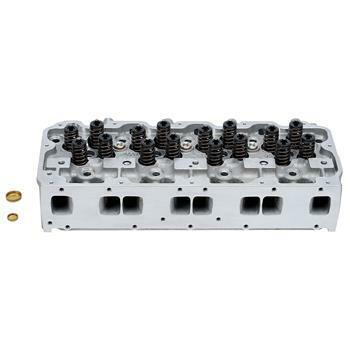 The all-new Edelbrock Cylinder Heads for 2001-2016 GM 6.6L Duramax Diesel V8 engines are a direct bolt-on replacement for any street or off-road application where higher levels of performance and durability are desired. These aluminum heads come complete and ready to run right out of the box and are designed to fit all variations of the Duramax engine that were offered in the popular Silverado HD pickup truck as well as Chevy/GMC vans and medium-duty trucks between 2001 and 2016. Edelbrock’s new cylinder heads are compatible with all stock Duramax valvetrain components as well as valve covers, water crossover, injector and glow plugs. Each A356 aluminum cylinder head casting is heat- and pressure-treated increasing both strength and fatigue properties. Intake and exhaust runners are designed to optimize flow and swirl, but race engine builders and head porters will appreciate the extra deck and port wall material for custom porting and deck strength. Best of all, the new Edelbrock cylinder heads are emissions legal, making them the perfect choice for a street performance upgrade to your Duramax Diesel engine.